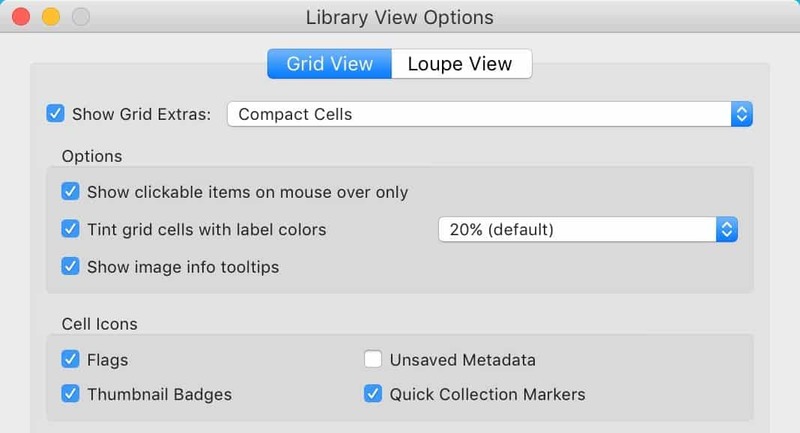 This is one of those handy tools that can really save time in some workflows. 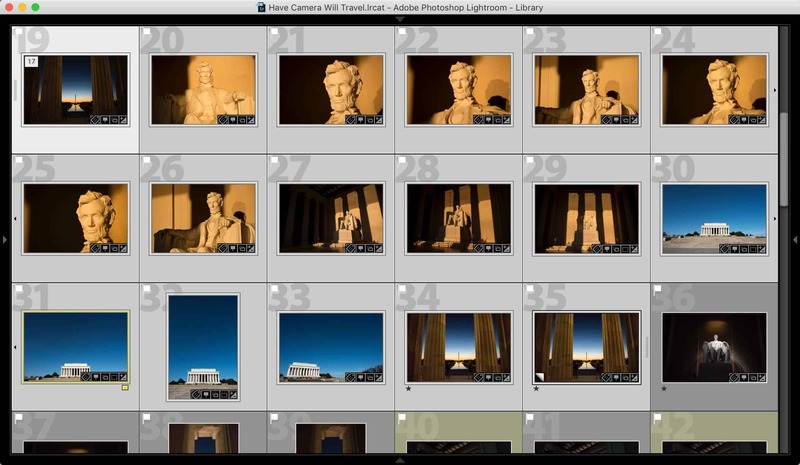 It's a built-in Lightroom feature to automatically stack images by capture time. At least, that's what it's called. But a more precise description is that it automatically groups images by the intervals between their capture time. This is especially especially useful for timelapse shots or when stacking similars shot together. Say, for instance, you've shot a timelapse with an interval of 5 seconds but you also have other images that aren't part of that timelapse sequence. Or maybe you're shooting a model in a studio and want a quick way to group together images when the model was wearing a particular outfit--since there'll be a time gap during wardrobe changes. Or maybe you want to separate sections of a wedding shoot by the segment of the event--the bridal prep beforehand, the ceremony, and the reception, for instance. For all of these, you can go through and manually stack the images, of course. But there's a handy little feature in Lightroom that can automates the process and save a lot of time in the right circumstances. It's the Auto-Stack by Capture Time feature. In this example, I'm going to stack timelapse shots I took. But it's not as simple as just selecting all and stacking them because I took some other photos and videos while I was there. And I only want the timelapse shots stacked so that I can see them separate from the other shots. Right click on any image and choose Stacking > Auto-Stack by Capture Time. Another way to access the same option is to use the top menu and go to Photo > Stacking > Auto-Stack by Capture Time. The shorter the time the more potential stacks you'll end up with. At the bottom left it calculates how many stacks and unstacked images will result from the given settings. In this example, I took the timelapse shots with a 0.5 second interval on a GoPro, so I'm going to select 1 second as the time between stacks. The stacks will then be created. The stacks are expanded by default, and you can see the stacked images with the darker background color. Since any other photos or videos that aren't in that sequence will be more than a 1-second from the others, they'll remain separate from the main stack. You can then collapse the stack by either clicking on the small white rectangle in the top left of the first thumbnail in the sequence or by right clicking and going to Stacking > Collapse All Stacks (or, from the top menu, Photo > Stacking > Collapse All Stacks. There are a few things worth noting. I've found that stacking operations can, for whatever reason, bring Lightroom to a crawl. The larger the number of images the worse the problem seems to be. It's especially bad when working with several thousands of timelapse images. It might be a Mac-specific issue, or it might be something specific to my setup. But it can definitely run slow when calculating stacks. You might sometimes get stray images in your stack. It all depends on how the shooting was done and whether there are other batches that fell within the separation time interval. But it's easy to remove single or multiple photos from a stack. 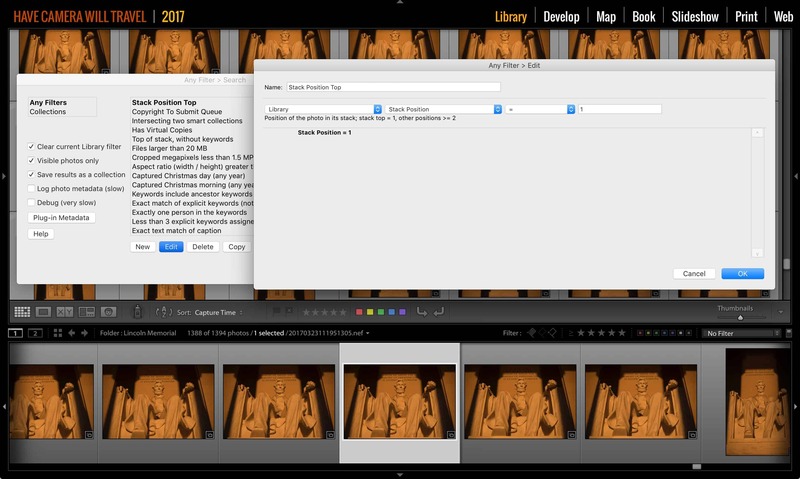 Just make sure the stack is expanded, select the photo or photos you want to remove, and go to Stacking > Remove from Stack. When using the function's slider to set the time interval, you can use seconds up to 1 minute and then whole minutes up to a maximum of 1 hour.